First of all, I’m guest posting today at A Beautiful Exchange! Check it out! To be honest, one of the negatives to our house is the bathrooms. Being an older house (built in the 50s), we don’t have an official “master suite”. This small upstairs bathroom is all we have. When we moved in, there was zero cabinet space and zero storage. 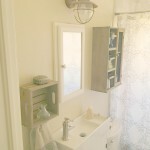 Instead of a medicine cabinet, I opted for a vintage shutter shelf and wire baskets. The bathroom is so small, I didn’t want to make it feel smaller with large storage. 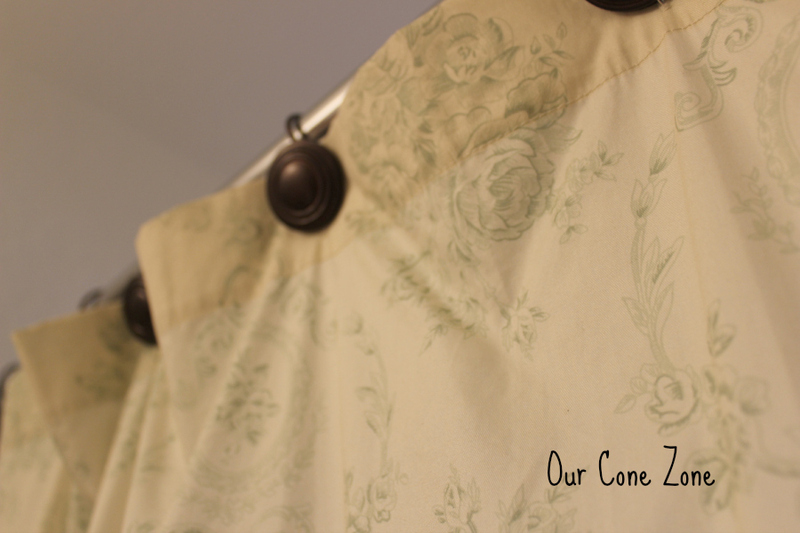 I’ve had this antique shower curtain since our first month in Texas, 7 years ago! 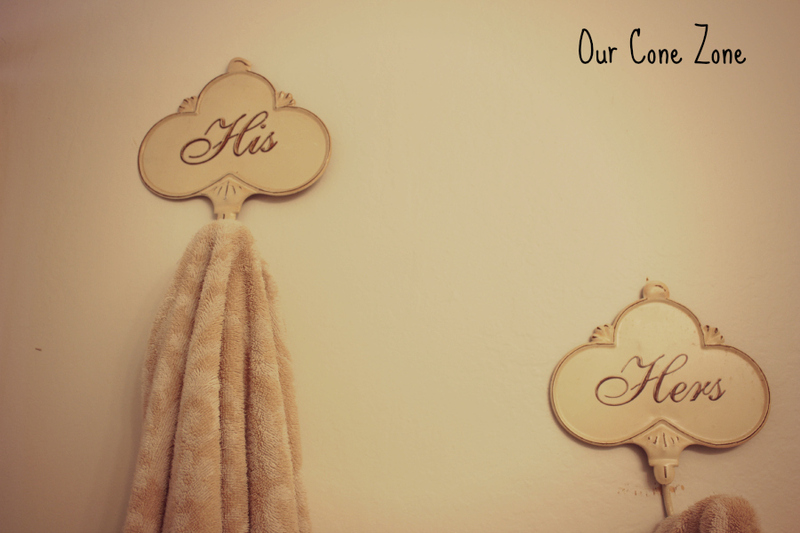 I bought these antique His and Hers towel hooks at a shop in Texas. When I say that this bathroom came with zero storage, I’m not kidding. 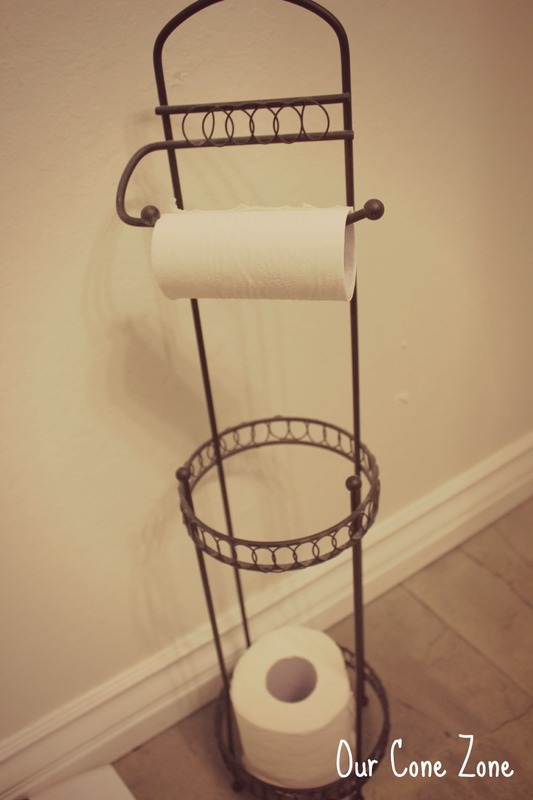 Our first day in the house, I had to buy toilet paper holders! Nothing had been built in. 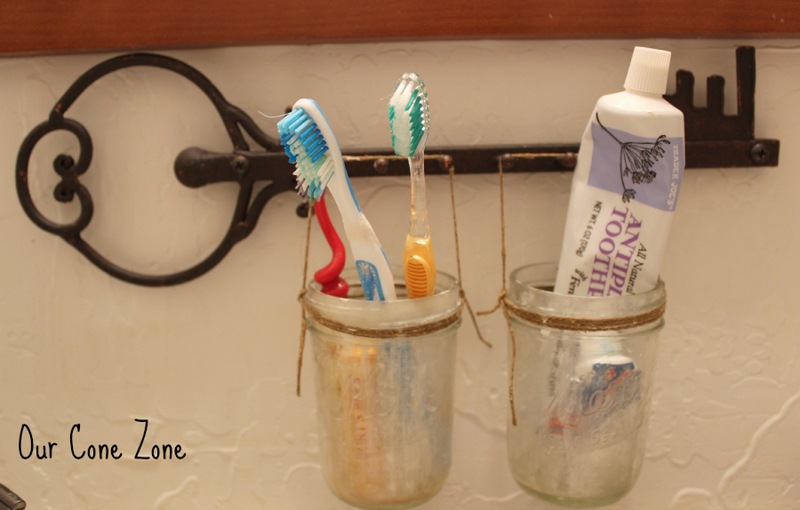 Since we have no counter space, I knew that our toothbrushes had to go somewhere. 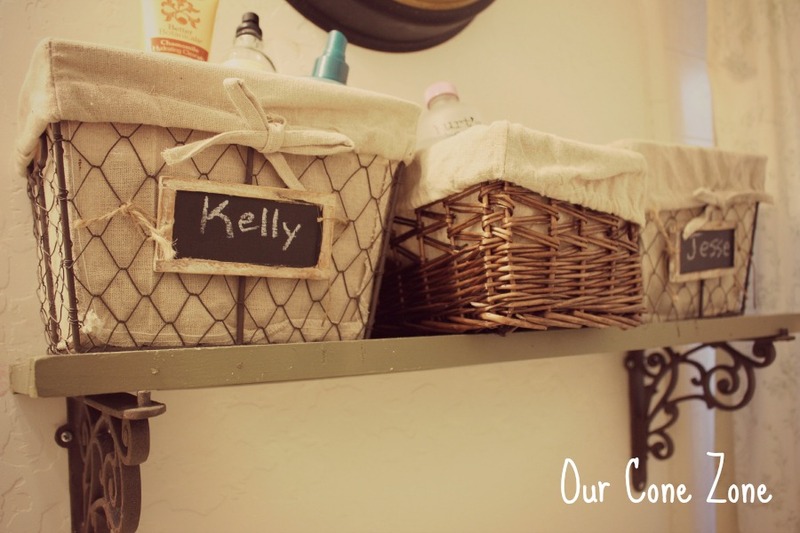 I used this vintage iron key hook, wrapped twine around a few mason jars, and voila! 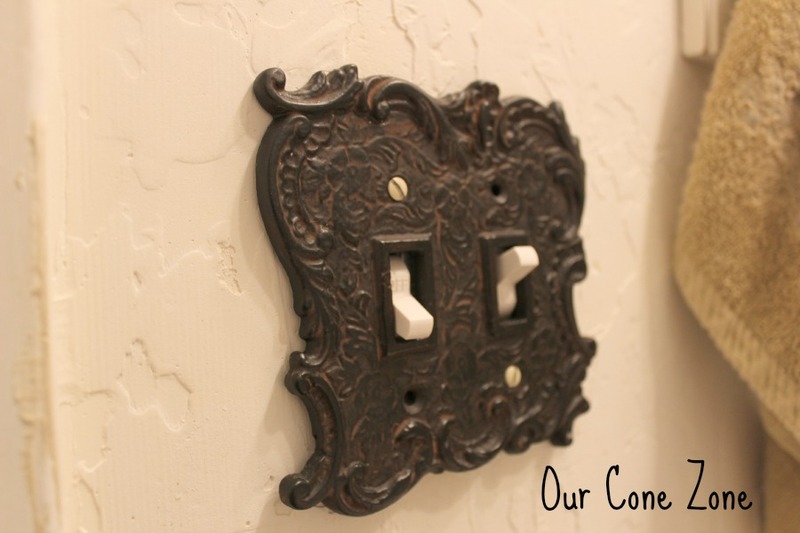 This switch plate isn’t vintage, it’s actually from World Market. The one downside to these is that they don’t seem to line up with any of our existing outlets! I can only fit two screws into it. Oh well. It’s stayed put for 11 months, so I guess it’s secure! 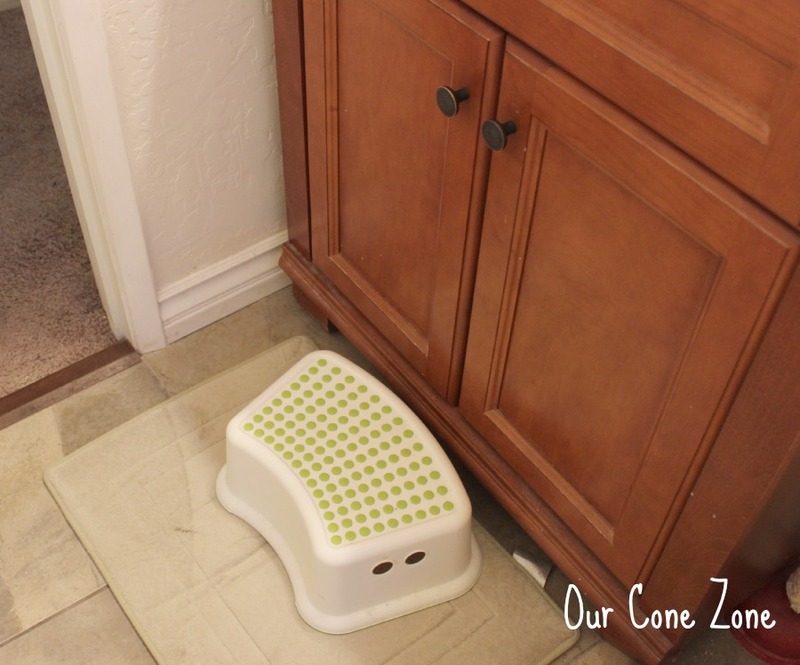 Since our nursery/toddlers’ bedroom is just two feet away, we also added a cheap stool from Ikea so that Gregory can wash his hands when he wants. Last but not least, my favorite part about this bathroom– the view from the shower. 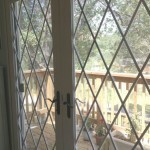 I love the light that this little window gives us, and most days you can watch the birds in the trees! It’s such a lovely, twee bathroom! 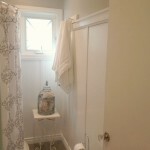 I love the light switch and shower curtain. Most houses in England just have one small bathroom. 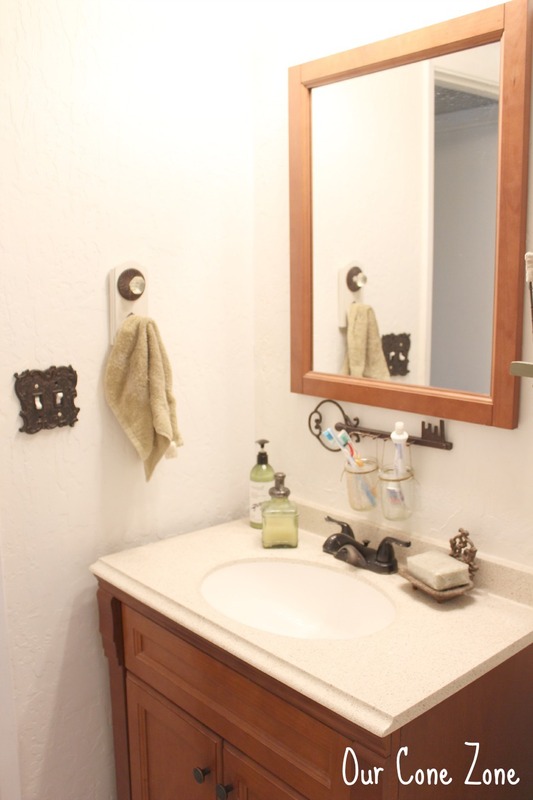 Growing up in my parents house, there were 6 of us and there is just a tiny bathroom, the length of a bath and just wide enough to fit the bath/sink/toilet in a row. 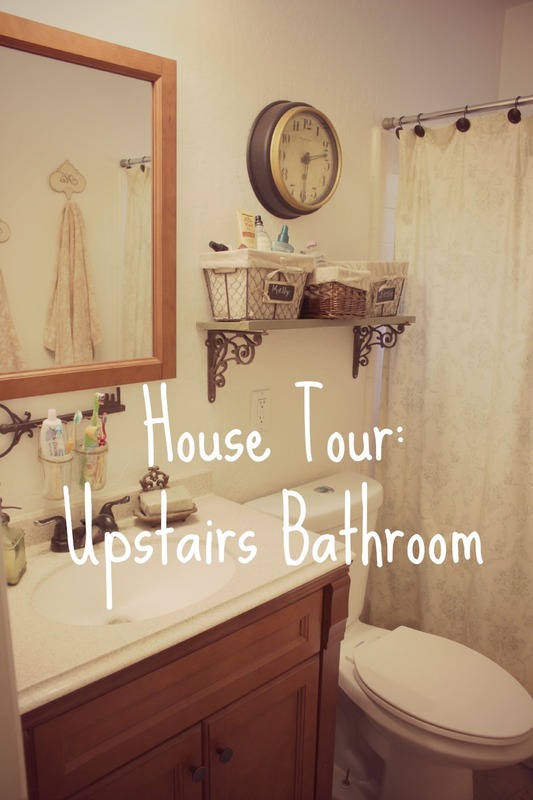 I love your home tour series! I have been following you for a little while now and love how creative you are with space! We have a small bathroom with very little storage ourselves so I have had to get pretty creative too! I am adding a few finishing touches to our home at the moment then I will be doing my own tour series! Anyhow, just wanted to pop by to officially introduce myself, instead of just silently reading along as I usually do!! 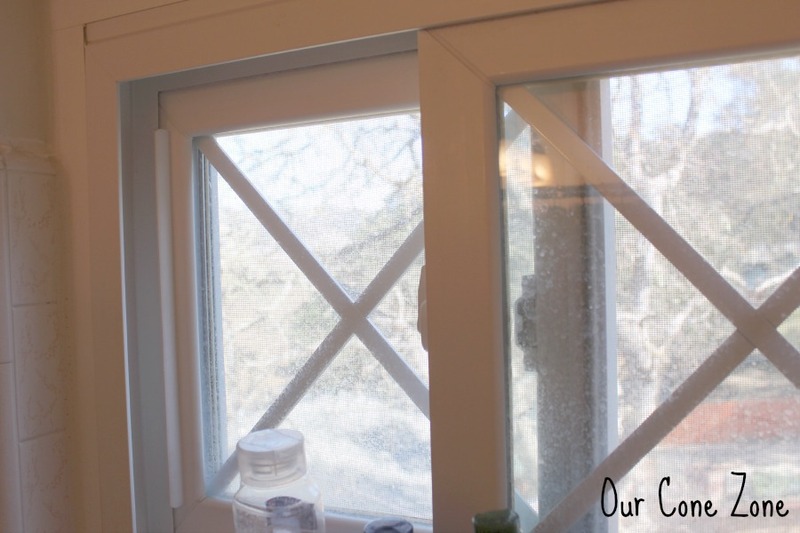 Thanks for sharing your gorgeous blog! Love the details!! Specially the switch plate covers!! Found ur blog via Shanna’s link up!! Come visit my blog whenever you have time! Hope you are having a wonderful day! Looks great! 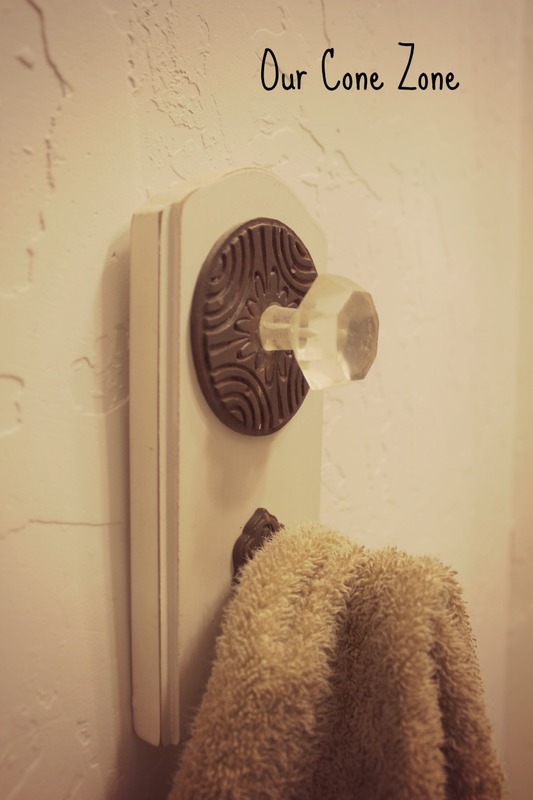 Love the door knob towel ‘hook’!! Thanks for stopping by earlier. Hope your week is going well!